Do you need an interactive, student-centered project that will encourage social justice activism, group collaboration, and online research and writing? Go beyond just reading dusty tomes written by dead people and regurgitating boring details. Delve into highly-engaging spoken-word poetry, music videos, TED Talks, an essay written by a 17-year-old Oklahoma author — and follow them up with highly engaging student discussions. This 3+ week unit contains everything you need to guide students through reading and viewing modern literature covering social justice topics, responding to daily essential questions, planning and writing a culminating essay, video, presentation, or children’s book that encourages students to tell their stories and take a stand for others. Go beyond just recognizing the elements of story and really delve into the meaning of the story — and how it’s relevant to students today. 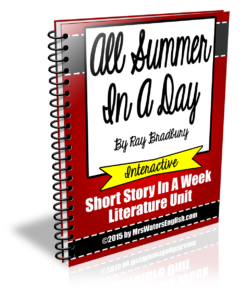 This unit contains everything you need to guide students through reading the story, responding to daily essential questions, planning and writing a culminating essay the encourages students to take a stand and back it up with information from the short story, non-fiction texts, video, and poetry. 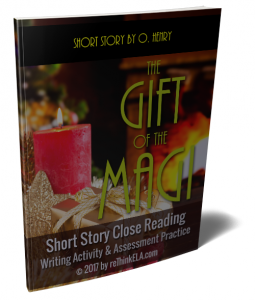 Do you need an interactive, student-centered service learning project that will encourage middle and high school students to turn their excitment Christmas break into a creative endeavor based on O. Henry’s “The Gift of the Magi”? This unit is full of highly engaging student discussions perfect for Christmas and encouraging students to think beyond themselves to how they can help others. Your students will love reading The Landlady by Roald Dahl as a class. My eighth graders were mortified and enraged at the close of the story. It’s perfect for Halloween! This short story resource is designed to help students analyze a complex work of literary fiction. 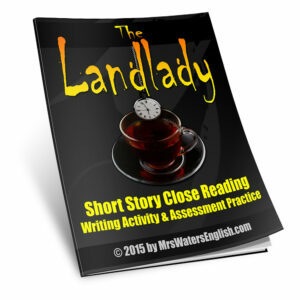 Specific questions presented in an assessment practice worksheet guide students through the process of analyzing the plot, characterization, setting, and theme of The Landlady. Note: “The Masque” is best suited for advanced middle or high school students. With today’s Ebola epidemic, Poe’s short story is as relevant now as it was when he wrote it. This short story resource is designed to help students analyze a complex work of literary fiction. 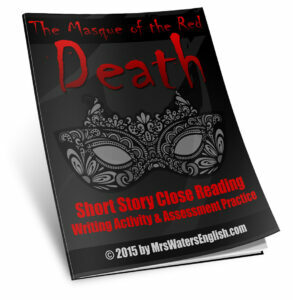 Specific questions presented in an assessment practice worksheet guide students through the process of analyzing the plot, characterization, setting, and theme of The Masque of the Red Death by Edgar Allen Poe. Do you need an interactive, student-centered project that will encourage bullying awareness and group collaboration? 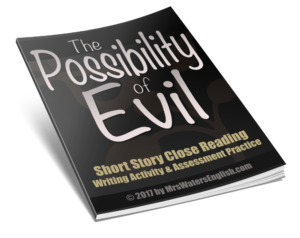 Not only is this short story unit, based on horror writer Shirley Jackson’s “The Possibility of Evil,” full of highly engaging student discussions perfect for Halloween and Bullying Prevention Month, but it encourages students to think beyond themselves to how they can help others.